It was a broadly bullish month for world equity markets, with net monthly changes, ranging from +11.4% (Russia), +11.1% (Brazil), +5.8% (USA), +5.2% (China), +2.1% (Germany) to -2.0% (UK). 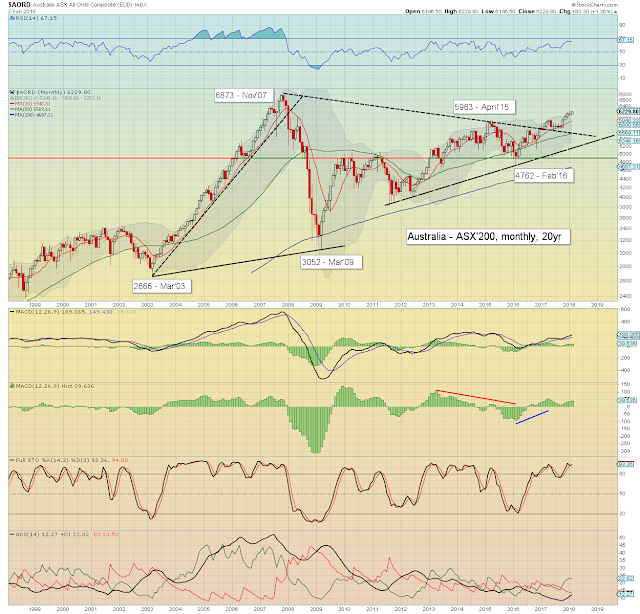 Mid term outlook is bullish, with most markets due 15-20% of further upside this year. The mighty Dow climbed for a tenth consecutive month, breaking a new historic high of 26616, and settling +1430pts (5.8%) at 26149. 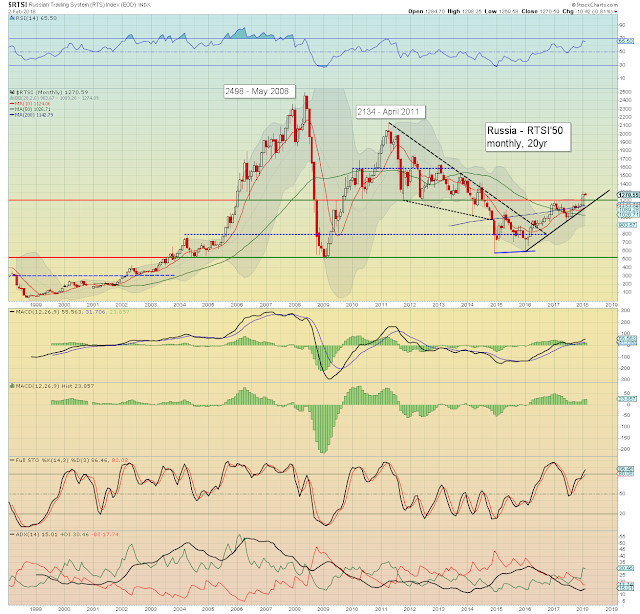 Note the upper bollinger, which as of the Feb'2nd close stands at 26122. Best guess: further upside of at least another 3-4% by March/April, to the mid 27000s, aka.. sp'2950 or so. 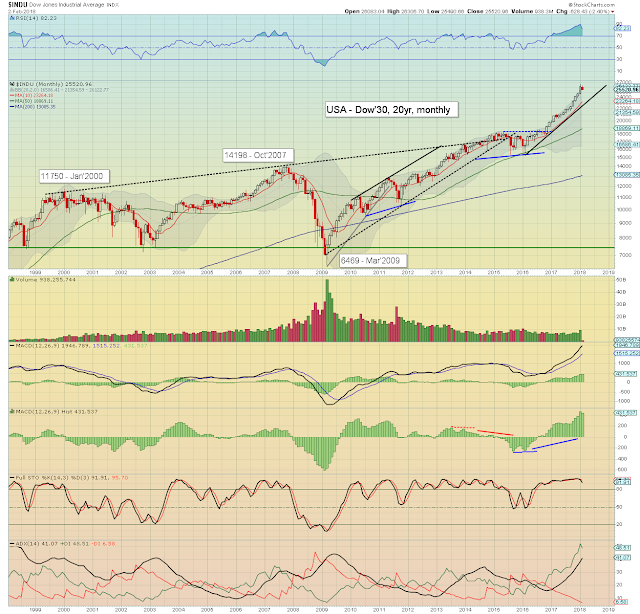 Considering this past week of price action, a correction of 10% seems probable this summer. A 15/20% major washout would arguably require a serious geo-political upset, which is inherently impossible to predict. 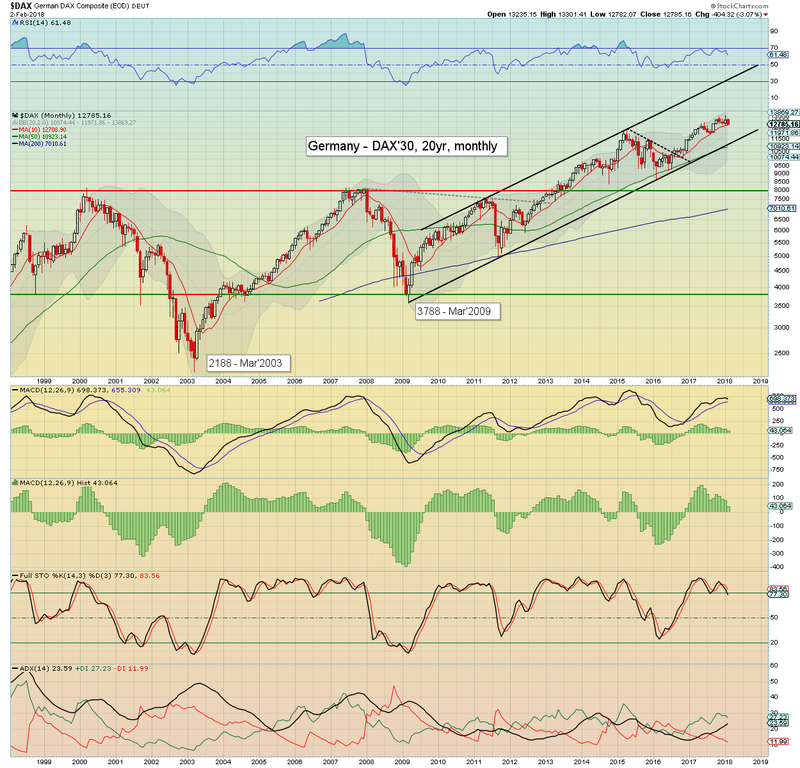 As things are, the year end target of sp'3245 is on track, and that would equate to Dow 29/30k. Equity bears have nothing to tout unless a bearish monthly close. For me, that would equate to a monthly close under the key 10MA, which currently stands at 23264, and is rising around 1000pts per month. 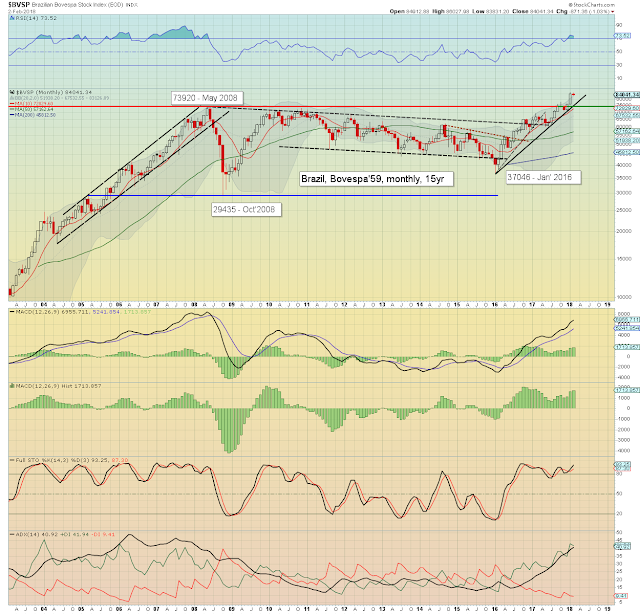 I do not anticipate any such bearish monthly closes this year. 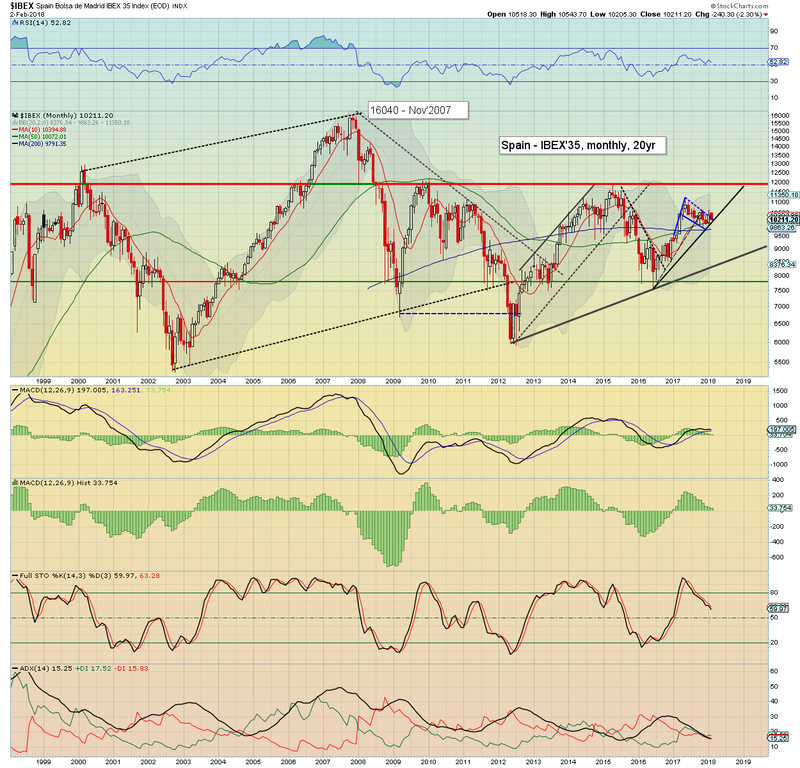 The economic powerhouse of the EU, saw the DAX gain 271pts (2.1%) settling at 13189, with a new hist' high of 13596. 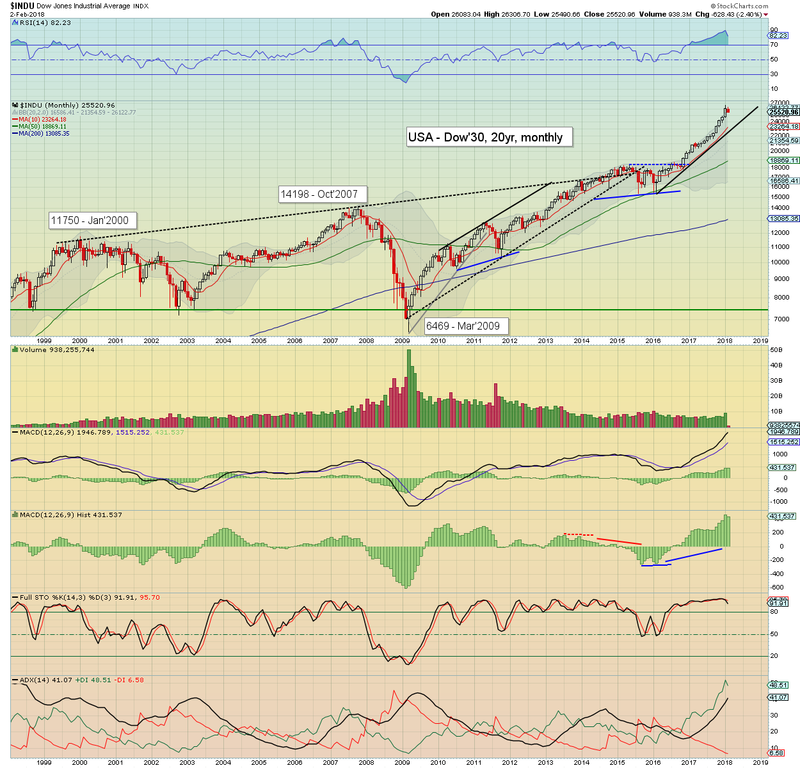 The m/t trend remains bullish, with 15k a valid target by year end. It would really help the EU financials - not least Deutsche Bank, if the ECB raise rates at least once this year. 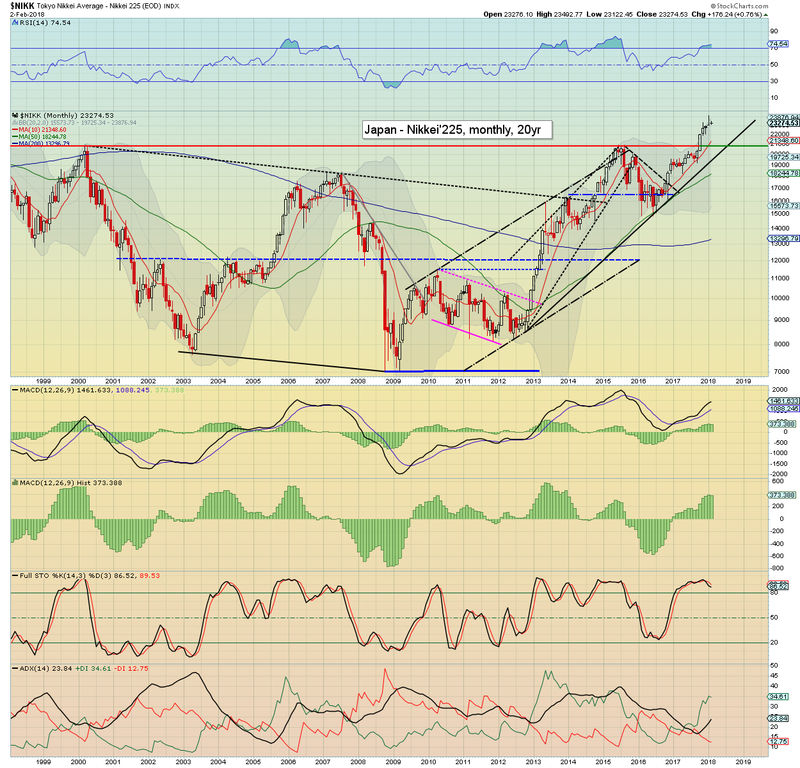 The BoJ fuelled Japanese market climbed for a fifth consecutive month, +333pts (1.5%), settling at 23098. Soft target is 25/26k, and then psy' 30k. 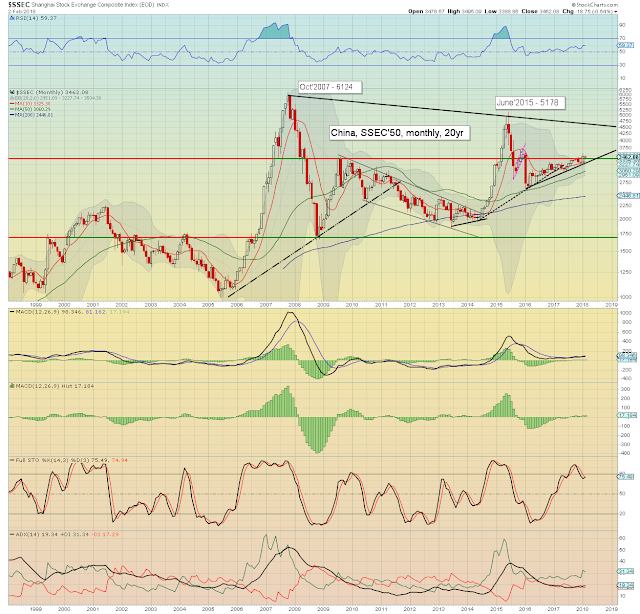 The historic high of 39815 is a valid target for late 2019/2020. 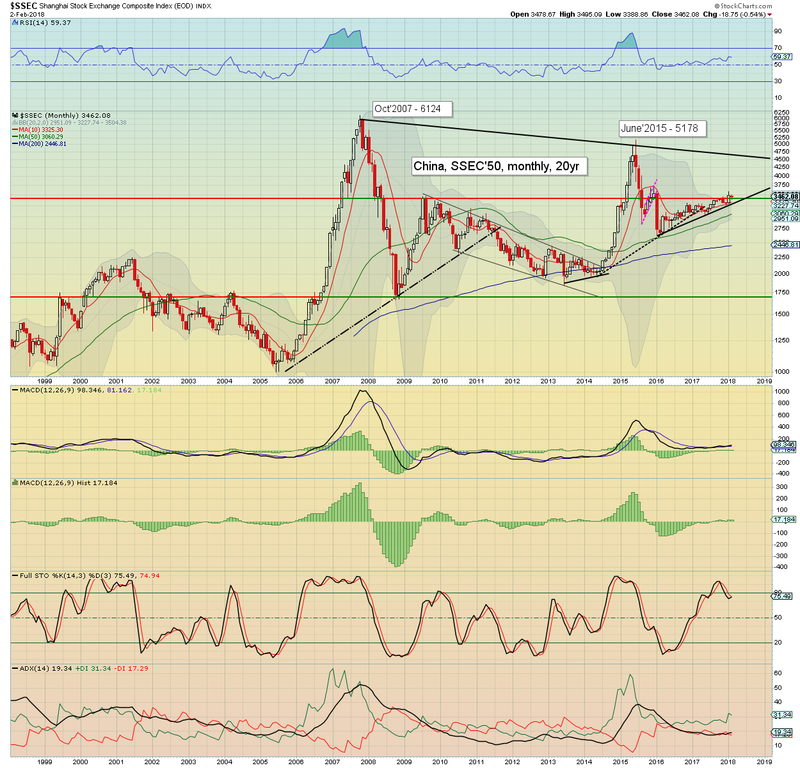 Chinese equities started the year strong, +173pts (5.2%) to 3480, with a notable intra month high of 3587. 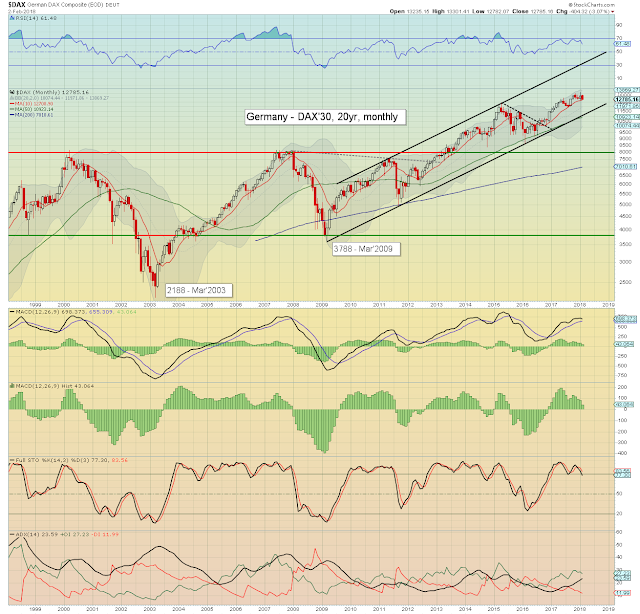 The January close >3450 is decisive enough to call for a grander move to the 4500s by spring 2019. 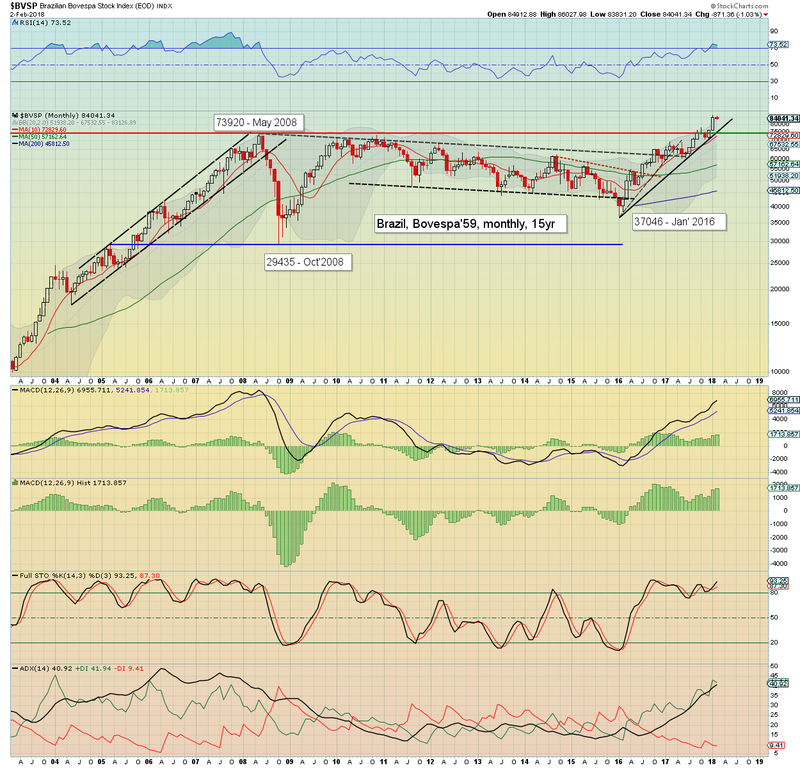 The Brazilian market powered higher, breaking a new hist' high of 86212, and settling +8510pts (11.1%) at 84912. Price structure is highly suggestive of a grander run to 100k. Notable energy stock, Petrobras (PBR) is an interesting consideration, for those who are bullish emerging markets and energy. The Russian market climbed for the 6th month of 7, settling +130pts (11.4%) to 1281. 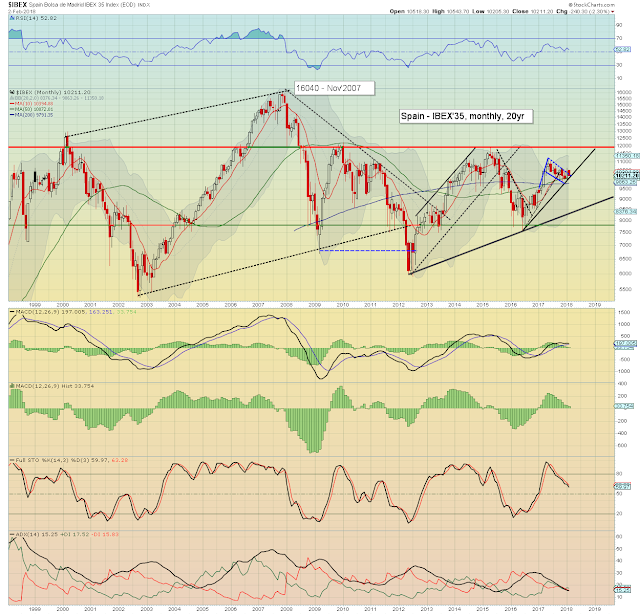 The break above the 1200 threshold is very significant, and offers basic upside to 1500 later this year. Higher energy prices would especially help the RTSI. My home market of the UK was the laggard this month. The FTSE broke a new historic high of 7792, but settled -154pts (2.0%) at 7533. The UK economy is struggling, with recent corporate implosions in Carillion and Capita, both indicative that 'all is not well'. The BoE are well aware that growth is weak, but they raised rates in late 2017, as they are concerned about rising inflation... largely a result of the weak pound. There are increasing concerns about BREXIT, as many now accept such an exit will likely be a net cost to the economy, at least on a 1-3 year basis. Finally, there is geo-political uncertainty. The May leadership is weak, and will inevitably crumble. Another election would see Corbyn win, and he is borderline communist. On balance, the 7k threshold should continue to hold into the spring, but if it does fail at any future point, it would be a devastating technical break. The French market remains m/t strong, +169pts (3.2%) at 5481. 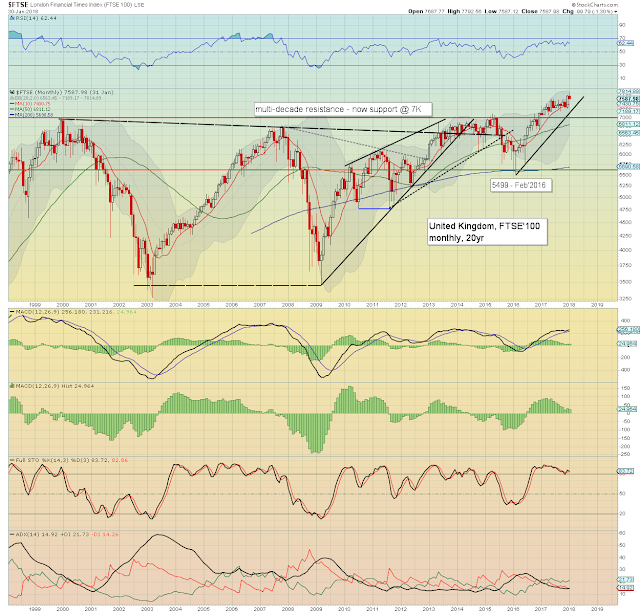 Upper monthly bollinger is offering the 5700s into the spring. Next big target is the June 2007 high of 6168, which looks viable before year end. The IBEX gained 407pts (4.1%), settling at 10451. Price structure since early 2017 is a giant bull flag, and offers a challenge to multi-year resistance of 12k. 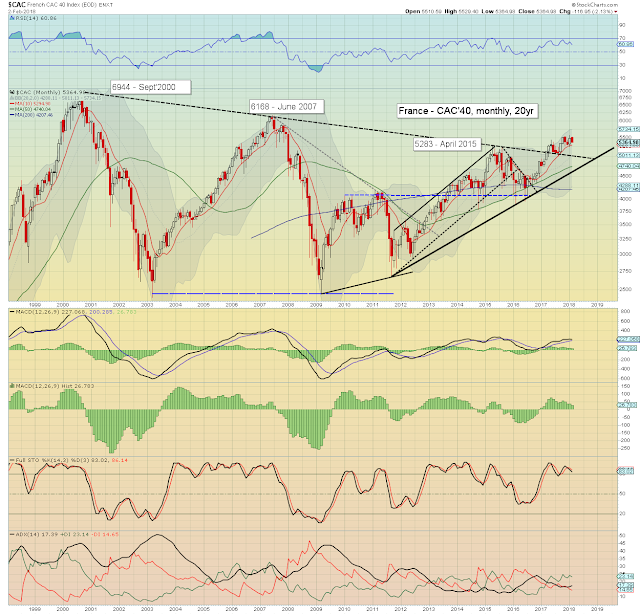 Any monthly close later this year >12k, will offer basic upside of another 25% to psy' 15K, and then the Nov'2007 historic high of 16040. 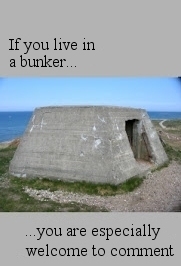 The latter is clearly out of range until 2019. 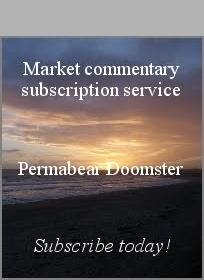 The Australian market broke a new multi-year high of 6256, but then cooled into end month, settling -24pts (0.4%) to 6146. 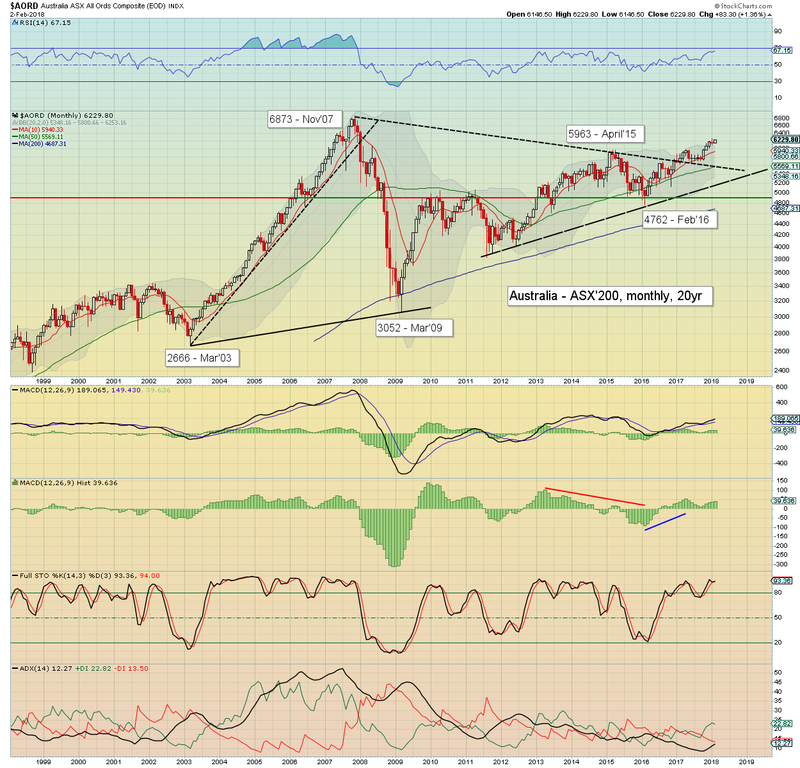 M/t trend remains bullish, a push to challenge the Nov'2007 historic high of 6873 is due before year end. If that can be taken out, it will offer the giant psy' 10k threshold within another 12-18mths. 8 of 10 markets saw significant net January gains. Russia and Brazil are leading the way higher, whilst the UK and Australia are lagging. The Russian and Chinese markets saw key bullish breakouts, with 'natural' technical upside of another 15% and 30% respectively. The m/t outlook for world equities is bullish, but there will likely be more volatility than 2017, with some sporadic 5/10% corrections along the way. *there are a few fed officials on the loose, notably Bullard (Tue') and Kashkari (Thurs'), the latter of whom remains against any rate rises.